So here I was conducting yet another workshop on Eclipse. This time it was in IIIT Bangalore. The campus is great, so are the students. It was the most interactive session I have ever been to. The students were quite active throughout the day and all of us were filled with enthusiasm until the very end. The workshop began at 9:30 am with Sudar Oli giving the kick off speech on IBM University Relation activities. This was followed by 2 theory sessions, followed by a hands-on session. The workshop lasted till 8 pm and I hear this is quite normal for guest lectures in IIIT! I was part of a team of three (myself, Sayeed Sanaullah and Gaurav Bhattacharjee) from ISL, who conducted a one day workshop on Eclipse in Vishwakarma Institute of Technology, Pune. 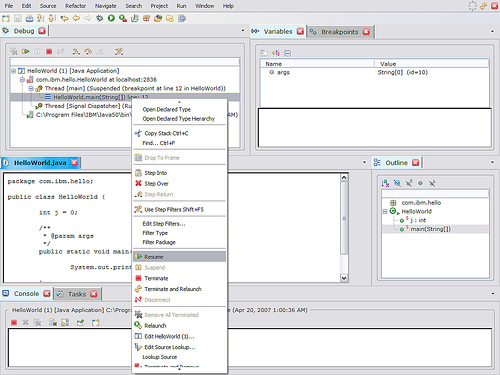 * RCP application development in Eclipse. The response was decent and I truly enjoyed the day, although at the end of the day it left us really tired. This workshop was conducted as part of the IBM Technology Day series that is being conducted in various colleges in India. This is the second time I am being involved in a IBM Technology Day. The very first IBM Technology Day in India was conducted in SJCE, Mysore in April. This was a 2 day workshop with about 7 speakers from IBM Software Group, Systems Group and Global Services. There were students from 7 colleges in and around Mysore who were part of this. I delivered a lecture on “Introduction to Eclipse and its usefulness” in VTU Edusat, a distance learning program of VTU. This is the first time I am delivering a lecture in VTU Edusat. * Excellent use of technology to reach distant colleges in Karnataka. * Currently Edusat has cast more than 3000 lectures. All of these lectures are available to the students if needed. * There is good industry backing. This can help bridge the gap between industry and academia. * It is more of a monologue right now. So there is absolutely no way of knowing the skill level of the students and tweak the lecture. Hats off to the guys behind this mission. This is a good first step; however there are things that can improve. If you are part of University Relations in your company, do join the Edusat program and make a difference! Wonder what they used to develop the IBM&apos;s Websphere Studio of products? One thing is for sure. These products are based on EMF models. EMF is the short for Eclipse Modeling Framework. It helps in developing models and then generating code for it. The model is described using yet another model called Ecore (which is again based on EMF). This model is platform independent. Yet another model called the Genmodel holds platform specific information that is used to generate code. 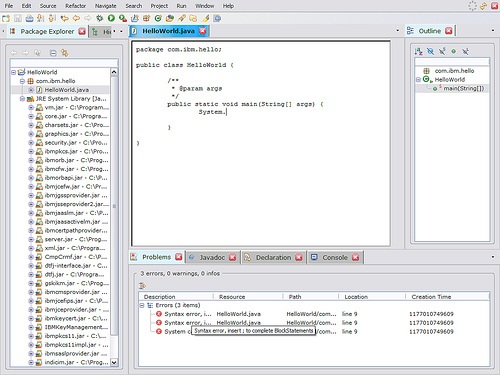 The code generation can be controlled using something called Java Emitter Templates (JET for short). The Ecore model can be developed using XML Schema, Rational Rose models, Annotated Java, Emfatic (from IBM) etc. The beauty of EMF is it is free and can be used with Eclipse. For those of you, who have read till here, but couldn&apos;t get a word of it, and still want to know more (because you feel it can help you someway and you feel my description was not good), refer to the standard EMF site. Also this interview with Dave Steinberg is worth a read. EclipseCon also has some resources for EMF.